The MPV has never had any substantial upgrade in its first generation lifecycle that lasted for more than six years. The Ertiga nameplate saw the light in India ahead of any other nation and it was the first monocoque MPV to be sold in the domestic market as well. The new generation model is based on the lightweight fifth-gen Heartect platform that also underpins the Swift, Dzire and Baleno, and has associated advantages with it. The seven-seater also sees a major change in its powertrain lineup as the 1.4-litre K14B four-cylinder VVT petrol engine making 95 PS and 130 Nm has been replaced by a more powerful in-house developed motor. The 1.5-litre K15B mill that debuted in the facelifted Ciaz produces a maximum power output of 104.7 PS at 6,000 rpm and 138 Nm of peak torque at 4,400 rpm. It is mated to a five-speed manual transmission as standard and a four-speed automatic is offered as optional. It also has dual-battery setup as the latest Ciaz. With the SHVS idle start-stop mild hybrid technology, the fuel economy has obviously been increased. Compared to the outgoing motor, the new SHVS unit is claimed to return nearly 2 kmpl more mileage at 19.34 kmpl. The automatic version has also become more frugal with ARAI-certified efficiency of 18.69 kmpl – up from 17.03 kmpl. The tried and tested 1.3-litre DDiS SHVS diesel engine continues to make 90 PS at 4,000 rpm and 200 Nm of peak torque delivered at 1,750 rpm and is connected to only a five-speed manual transmission. The improved economy meant that Maruti Suzuki claims 25.47 kmpl at an increase of close to 1 kmpl from the outgoing model. The higher mileage numbers do strengthen Ertiga’s position as the most fuel efficient in its segment. 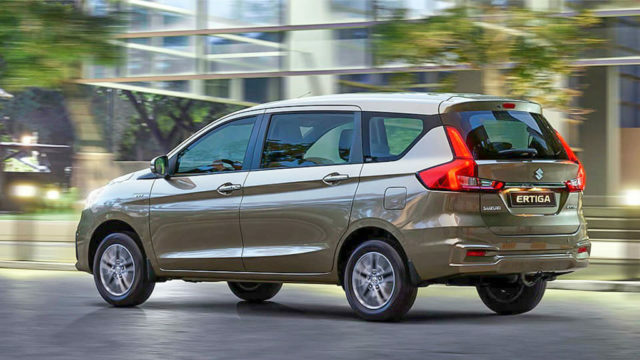 Due to the presence of new architecture, the new Ertiga has grown in dimensions. It now measures 4,395 mm in length, 1,735 mm in width, 1,690 mm in height and has wheelbase of 2,740 mm with bootspace of 209 litres (with all three rows up), 550 litres (with 3rd row down) and 803 litres (with 2nd and 3rd row down). Becoming lighter, it tips the weighing scale at 1,135-1,170 kg for petrol and 1,220-1,245 kg for diesel. When compared to the outgoing model, the 2018 Ertiga is 99 mm longer, 40 mm wider and 5 mm taller with same wheelbase while the bootspace capacity is 74 litres more when all three rows are up. The fuel capacity stands at 45 litres and it has 5.2 m turning radius as before. The new Ertiga gets a raft of cosmetic updates to ensure better road presence. For instance, it comes with sleeker headlamps, chrome embellished new front grille, wider air inlets, restyled bonnet structure, aggressive character lines and a rear-end boasting L-shaped tail lamps, chrome boot applique and so on. 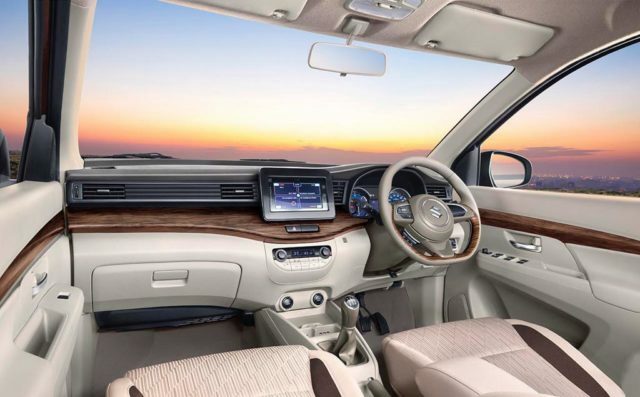 The level of modifications inside the cabin is as substantial as the exterior with layered dual-tone dashboard, revised centre console, use of premium quality soft-touch materials, faux wooden trim, chrome door handles, new flat-bottom steering wheel wrapped in leather, etc. 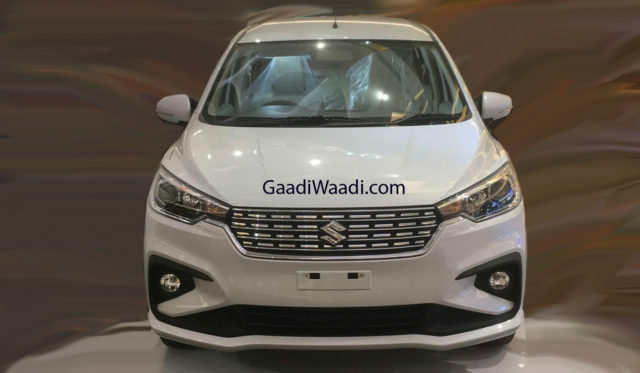 The 2018 Maruti Suzuki Ertiga has a new and potent rival in the form of Mahindra Marazzo and it has become more upmarket in visual and interior side of things to firm up the competition. 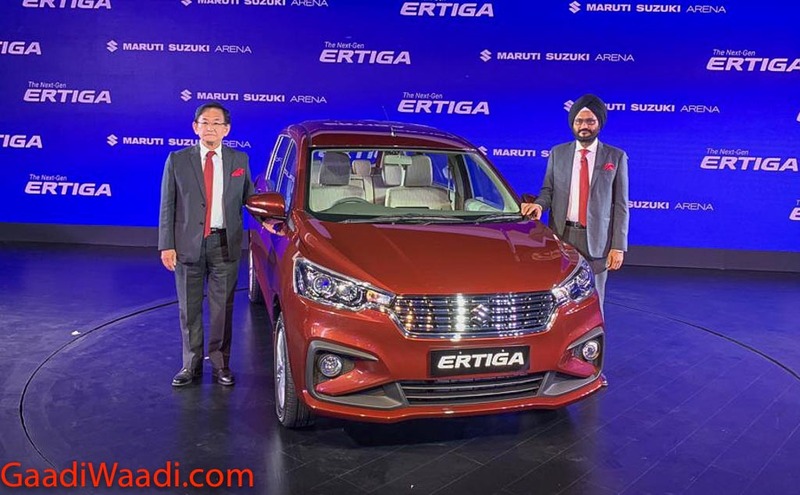 We expect the changes to increase Ertiga’s average monthly sales of 4,000 units and help in garnering more young buyers. As for the features, dual front airbags, ABS with EBD and ISOFIX child safety seat anchors, rear parking sensors, speed sensitive door locks, central locking, projector headlamps, LED tail lamps and tilt adjustable steering wheel are offered as standard. The high-end ZDi comprises of SmartPlay touchscreen infotainment system with navigation, Apple CarPlay and Android Auto connectivity, leather wrapped steering wheel and rear parking camera among others. The third row also has reclining mechanism while on-touch recline and slide system will help in easy access to the final row. Maruti Suzuki and its suppliers have spent over Rs. 900 crore in developing the new generation Ertiga. It will be sold across 2,200 Arena dealerships across the country and looks to emulate the success of over 4-lakh unit sales of the first-gen model.